Junior Jamie McNamara has played in every game for the Mammoths, and registered a goal and an assist against New English College on Nov. 26. The Mammoths responded two minutes later, when Laura Schmidlein ’19 scores her first goal of the season to even the score at 1-1. Despite Trinity taking the lead again in the second period, Amherst managed to peg them back, knotting the score at 2-2 off of senior Alex Toupal’s unassisted goal. Amherst then made use of a third period offensive spree to clinch the win. Miriam Eickhoff ’19 gave the Mammoths their first lead of the day just 53 seconds in the last stanza of play, with assists awarded to Toupal and sophomore Eliza Laycock. Toupal then notched another assist on the next goal by Jocelyn Hunyadi ’19 to put Amherst up 4-2. The Mammoths continued to pour it on, as junior Katelyn Pantera scored off a power play goal from another pass by Toupal before Rose Mroczka ’21 put the final nail in Trinity’s coffin with an unassisted goal toward the end of the game, registering her first collegiate point, giving Amherst the 6-2 win. Amherst closed out the game with 5 unanswered goals. The next day, the Mammoths returned to the ice and once again routed the Bantams in a decisive 4-1 victory. Unlike the first game, the Mammoths got off to a quick start that pushed them into an early lead and would not relinquish it at any point. Amherst’s first goal of the day came in the opening period after Eickhoff collected a pass from Hunyadi and capitalized on the team’s first man-up opportunity. Toupal registered the second assist on this goal and, with this point, registered the 100th point of her collegiate career. Toupal has scored 12 points on the year, and now sits sixth on the Amherst women’s hockey all-time scoring list. Courtney Hanlon ’12 is the leading scorer with 126 points. Back on the ice, both teams fought back and forth for the remainder of the first period, and Griese scored what ended up being the game-winner off an assist from senior defender Kristen Molina. Hunyadi continued her weekend-long dominance, giving the Mammoths a commanding 3-0 lead on an unassisted effort in another man-up situation in the second period. While Trinity managed to pull one goal back in the third period, Schmidlein restored Amherst’s three-goal advantage with a tally assisted by Molina and Hunyadi, which doubled as the final goal of the game. 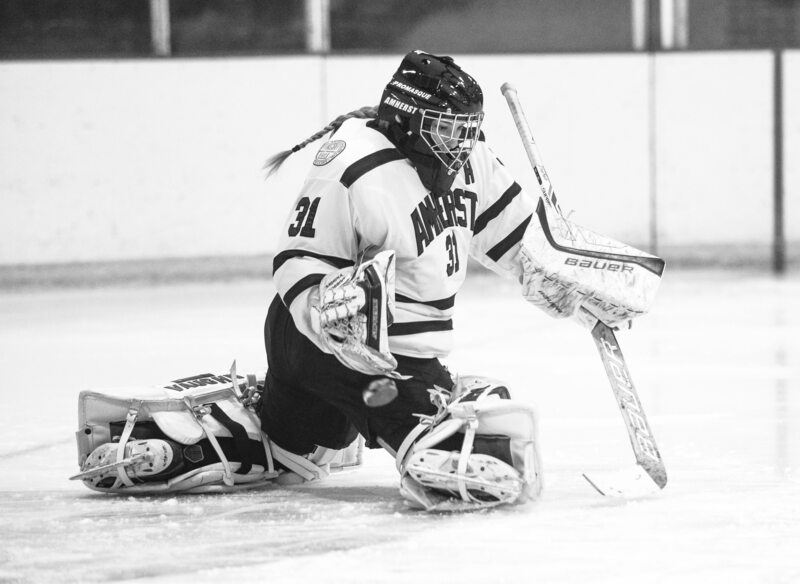 Amherst’s next game is against Norwich University at Orr Rink on Wednesday, Dec. 6 at 7 p.m.